Already a Golden Globe winner for Best Motion Picture – Animated and a near shoe-in for the Oscar this year, Coco offers so much that it really is a complete movie for both children and adults to enjoy. The Mexican culture is steeped in rich tradition and ceremony and offers its people a sense of community and belonging. The music, food and holidays are unique and distinctive and give the country its long history. Therefore, it is no surprise that Disney and Pixar teamed up to create a magical animated tale encompassing these factors. Coco, coming to 4K, Blu-ray, DVD and Digital HD, encapsulates the best of Mexico and its people and highlights the culture set around the backdrop of the holiday of Dia de Los Muertos. The sights and sounds of Mexico come alive as Miguel travels to the Land of the Dead to learn a valuable lesson about love and family. Miguel (Anthony Gonzalez; Icebox) is a 12-year-old boy who has grown up in a family of shoemakers. They love what they do and they love their family but there is one thing they forbid in their house… music. You see many, many, many years ago Miguel's great, great, great grandfather left home, abandoning his wife and young daughter, to become a famous singer and musician. Unfortunately, he never returned and so music has been banned in Miguel's family ever since. Miguel, however, loves music and wants to be a performer himself, a concept that would never "fly" in his home. When Miguel steals the guitar of famous musician Ernesto de la Cruz (Benjamin Bratt; Law and Order) to enter a talent contest, things don't go according to plan and he finds himself in the Land of the Dead. Once there, the only way for Miguel to get home is by promising his ancestor that he will give up music forever. Unwilling to do so though, he seeks out his long-lost great, great, great grandfather (whom he believes is the great musician Ernest de la Cruz). With the help of another musician named Hector (Gael Garcia Bernal; Y Tu Mama Tambien), Miguel learns the truth about the past and finds a way to go home and keep his musical dreams alive. What a magnificent story Coco is, and it was engaging from the very beginning. While the underlying themes of family and doing what you love are prevalent, they are presented in a way that seems fresh and original. The Mexican culture adds another dimension to the story and has a distinct flavor that is appealing. The cast is terrific, especially the young Gonzalez. Garcia Bernal is also enjoyable as a skeletal scamp. The music is a character of its own and it is ripe with heritage and tradition. The colors of Coco are so vibrant and numerous that every scene pops off the screen magnificently. The detail is exceptional as well, which shows just how far the art of animation has come in the last 20 years. The 4K Blu-ray (Ultimate Collector's Edition) is presented 2160p high definition with an aspect ratio of 2.39:1 which only adds to the fantastic picture quality. The Dolby Atmos audio is an excellent complement to the picture and showcases the soundtrack beautifully. The full-bodied instruments used in much of the music created in Mexico envelope the viewer and surround you mush like a warm blanket on a cold, wintery night. The Combo pack comes with the 4k Blu-ray disc, the regular Blu-ray disc, bonus features discs and the digital download code. The bonus discs have several interesting extras that range from capturing the moment Gonzalez was told he had the part of Miguel to footage of the creative team's visits to towns in Mexico to do research for the film. 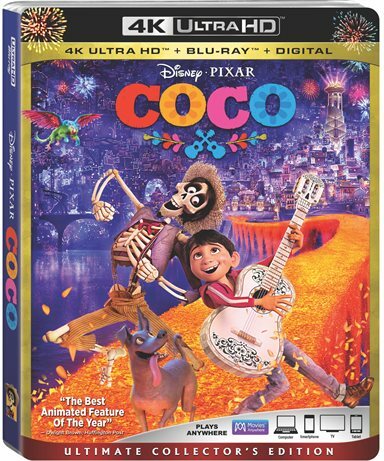 They include: Welcome to the Fiesta, Mi Familia, Dante, How to Draw a Skeleton, Audio Commentary with Director Lee Unkrich, Co-Director Adrian Molina, and Producer Darla Anderson, A Thousand Pictures A Day, The Music of Coco, Land of Our Ancestors, Fashion Through the Ages, The Real Guitar, Paths to Pixar: Coco, How to Make Papel Picado, You Got the Part!, Deleted Scenes, and Trailers & Promos. While many of the extras are informative, my favorites are The Real Guitar; Paths to Pixar: Coco, and A Thousand Pictures A Day. For someone who has never been to Mexico, the last one is a look inside the people, their traditions and the culture of this country.